SYRACUSE, N.Y. - A professor at the SUNY College of Environmental Science and Forestry (ESF) has been honored by the National Wild Turkey Federation for his years of pioneering research. Dr. William F. Porter is the recipient of the 1998 Henry Mosby Award, which honors outstanding achievement in turkey research. Porter, a wildlife biologist who resides in Skaneateles, is a member of ESF's Faculty of Environmental and Forest Biology. He has been studying wild turkeys for more than 20 years. His work as a graduate student was the first to show that wild turkeys could thrive in agricultural areas and that they did not need mature forests in order to survive. Another four-year study recently resulted in a booklet, "The Future of the Wild Turkey," which examines the bird's history in the state, its breeding habits, and mortality rate. He and his students have used satellite imagery to examine wild turkeys' habitat on a large scale. Porter received the award, a sculpture of three wild turkeys on a wooden base, at the federation's annual convention in Indianapolis. The award is named for a biologist who devoted 40 years to wildlife conservation and who helped establish The Wildlife Society. 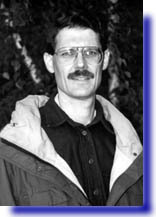 Porter has been a faculty member at ESF since 1978. He is director of the Adirondack Ecological Center.